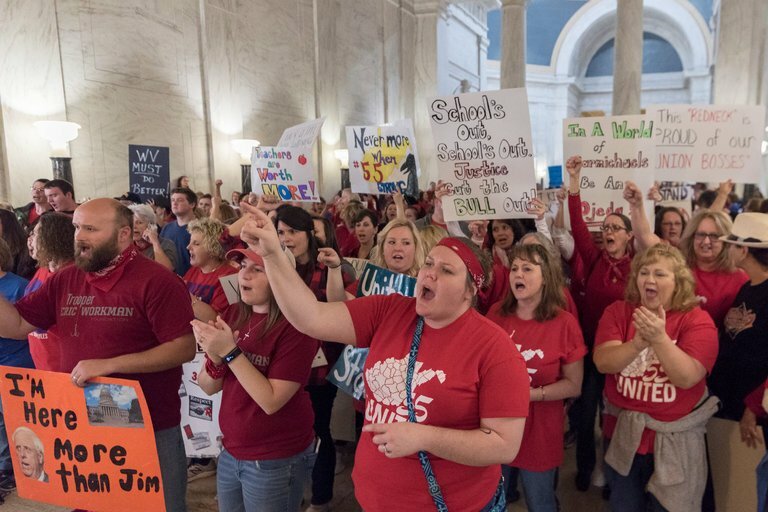 Following the footsteps of teachers from West Virginia, who succeeded in getting a pay-rise of 5% after a nine-days long strike, tens of thousands of teachers in Oklahoma and Kentucky struck work on Monday this week. They were protesting against cuts to their pay and benefits, and against the reduction in school funding. According to reports , about 500,000 of the 700,000 public schools remained closed in Oklahoma, where more than 30,000 teachers walked out of and have decided to remain on strike until their demands – including a $10,000 rise in pay for the next 3 years and an increase of state funding of education by $75 million – are accepted. OECD report, Education at a Glance 2017 , revealed that, on average, high-school teachers in U.S “earn less than 60% of the similarly educated workers (in other developed countries). They have among the lowest relative earnings across all OECD countries” for which data was available, the Quartz reported in September last year. Within U.S, Oklahoma is one of the states whose teachers are paid the lowest in the country, with an average annual pay of $45,245, which is just over that in South Dakota and Mississippi, and just under the pay in West Virginia. Highest earning among the high-school teachers within U.S is in the state of New York, where an average of $79,637 is their annual pay. The city legislature has voted in favour of an average pay-rise of $6,000 per year. But the teachers of Oklahoma, whose salaries haven’t been hiked for ten years now, have found it insufficient, and persisted in their demand for a $10,000 rise, apart from additional funding for schools and pay hikes for the support staff including bus-drivers and custodians. In Kentucky, where the average annual pay for high-school teachers is $52,339 – which is higher than Oklahoma and West Virginia – the protests were triggered a day after a bill was passed last week in the State house and Senate to reform the pension system. This bill, if signed into a law, “will phase out defined-benefit pensions for teachers and replace them with hybrid retirement plans that combine features of a traditional pension with features of the 401(k) accounts used in the private sector. Teachers in the state are not eligible for Social Security benefits,” according to a report . All these strikes have occurred in Republican-dominated states, where the process of unionisation is weaker due to restrictive union laws. Nonetheless, these mobilizations has been made an impact.